What Exactly Is Horticultural Oil? Oil-based pesticides are an effective and ecologically friendly way to handle many garden insect pests and even some diseases. The majority of pest control oils are some type of mineral oil, a refined petroleum product. There are a few vegetable oils that are also effective pesticides, such as cottonseed oil and soybean oil. The oil is usually combined with some type of emulsifying agent so that it can be mixed with water and used as a spray. Oils first became popular as a way to control pest problems on fruit trees. Fruit trees posed a unique problem because they were so pest-prone and yet you couldn’t just spray with any insecticide, because it’s an edible product, and you couldn’t kill off all the insects, because you needed the good guys for pollination or there would be no crop. So an oil based insecticide was developed for use during the dormant-season before the flower buds began to open. This ‘dormant oil’ killed off over-wintering insects such as aphids, mites and scale. The first dormant oils were heavy and you couldn’t safely use them on actively growing plants or you could damage the foliage. Dormant oils were further refined to produce lighter-weight oils that can be applied during the growing season, without harm to many plants. When the term dormant oil is used now, it generally refers to the application timing, during the dormant season, rather than a type of oil. Summer or All-Season oils are a lighter version of dormant oil that could be applied to plants during the growing season. You still need to use caution when applying summer oil. Oil treated plants will burn in the hot sun and many plants can’t handle oil at all. But summer oil is now being combined with additional insecticides for even broader control with less possibility of plant damage. So although there was a definite difference between summer and dormant oils, most products sold commercially are labeled general purpose horticultural oil. To confuse matters further, the term “superior oil” was used to describe the improved, more highly refined oils that are safer when applied to leaves during the growing season. All horticultural oils now sold are superior oil. Application rates vary according to the season, but “horticultural oil” has become the common usage term. The primary way horticultural oil kills insects is by suffocating them. The oil blocks the spiracles through which insects breathe. Hort oils also disrupt the metabolism of insect eggs and the ability of some insects to feed, causing them to starve to death. Not a pretty picture, but remember that insects, like aphids, carry diseases from plant to plant by feeding. Horticultural oil is a labeled pesticide and should always be used according to the label’s instructions. 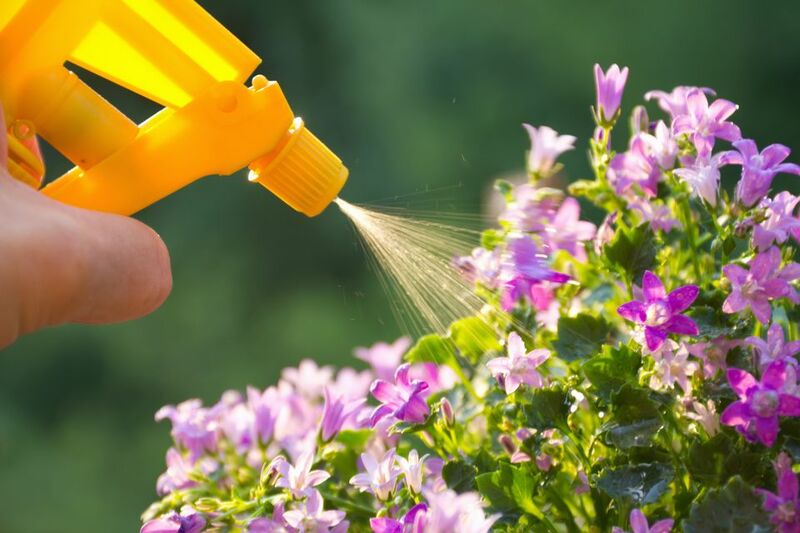 Good bugs, as well as bad, can be affected by spraying horticultural oil, so use only when absolutely necessary. Hort oils need to be sprayed directly on the pests, to be effective. The excess oil evaporates and dissipates quickly, so there is no toxic residue and horticultural oil is considered safe to use around humans and pets. If ‘dormant oil’ is recommended, apply just before either leaves or flowers show signs of swelling or breaking open. You don’t want to apply too early though, since the insects need to be active and breathing, in order to be affected. Summer applications are easier to time. Horticultural oils are most effective on young, soft and slow-moving insects and less so on mature insects. You will need to keep watch for when the insects first appear. During Extremely High Temperature: Do not apply horticultural oil when temperatures are about 100 degrees F. (38 degrees C.) Stressed plants, particularly drought-stressed plants are more susceptible to hort oil damage. During Freezing Temperatures: Do not apply horticultural oil in freezing temperature because the emulsion doesn’t hold together and coverage is uneven. When Plants are Wet or During High Humidity: Applying horticultural oil in damp conditions decreases the rate of evaporation and puts the foliage at risk of burning. During the Fall: For some reason, spraying with horticultural oil in the fall puts plants at increased risk for winter damage and dieback. Where Sulfur or Pesticides Containing Sulfur have Been Used in the Past 30 Days. Sulfur and hort oil combined is a toxic combination for plants. On Plants Known to be Sensitive to Horticultural Oil. You will usually find a good list on the back label of the ​package. Adelgids, aphids, caterpillar eggs, leafhoppers, mealybug, mites, scale, spider mites, thrips, and whiteflies are the most common targets of horticultural oil. Hort oil is also effective against powdery mildew. The popular homemade baking soda recipe includes horticultural oil as an active ingredient. And since hort oil is effective against aphids, which spread viruses by feeding on plants, hort oil is also something of a virus control. How Do You Grow Spider Plants?